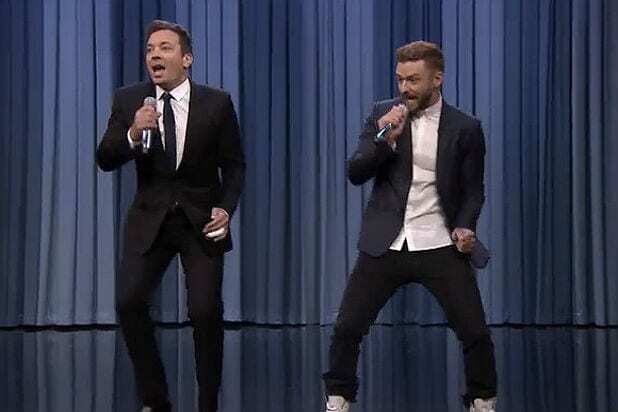 A guest lineup that included Justin Timberlake, Ellen DeGeneres and musical guests Macklemore & Ryan Lewis helped “The Tonight Show Starring Jimmy Fallon” best the second night of “The Late Show With Stephen Colbert” Wednesday in Nielsen live-plus-same day ratings. The “Tonight Show” drew a 1.2 rating among adults 18-49 and 8 share, with “The Late Show drawing an 0.8 and 7 share. In total viewers, Fallon drew 4 million to Colbert’s 3.7 million. Colbert’s second-night guests were Scarlett Johansson, Elon Musk and Kendrick Lamar. In final household ratings, Fallon drew a 2.8 to Colbert’s 2.6. Early numbers had given the household edit to Colbert, 3.2 to 3.1. ABC’s “Jimmy Kimmel Live!” remained in third place in final numbers, with a 0.5 demo ratings, 1.9 million viewers, and a 4 share. Fallon will welcome guests Andy Samberg and Carrie Underwood Thursday night, while Colbert will feature Vice President Joe Biden, Toby Keith and Travis Kalanick.